It’s your turn to show the world what SHSU means to you. 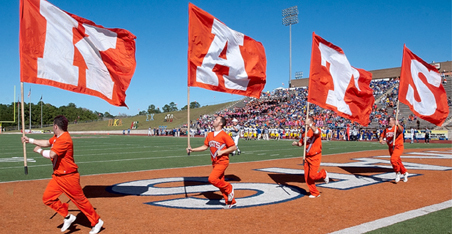 You will have :30 to show the people, the places, and the events that make Sam Houston State University the experience that you will carry with you where ever life takes you. All you need is a video camera (cell phone, iPad, whatever), an imagination, and you are ready to make “YouTube Gold!” Then you submit your application, we add your video, and everyone votes. The contest starts , and submissions will need to be in by 10/23/12. Check back here for contest guidelines and updates as we near the start of the contest. 1st Place individual or team becomes an actual commercial for SHSU that will be shown regionally, and will also receive the Nook Tablet! 2nd Place individual or team receives the Nook Color! 3rd Place individual or team receives the Nook Simple Touch!